My grandmother – the one on my father’s side – was a school teacher. Kindergarten in fact. She had a smile and something nice to say to everyone. She kept cookies in her car to give to toll collectors. She couldn’t sit in a restaurant without engaging the baby at the next table. She kept a list next to her kitchen phone of birthdays and anniversaries. Every time Bubbie took the train down from Philadelphia to visit us, she would collect piles of paper Amtrak conductor hats for us (and her students). One of my favorite memories is her wearing one of those conductor hats and leading all of the grandchildren in a parade around the island in my aunt’s kitchen. Well, she was the caboose, leading from behind, but the conductor nonetheless. Before she and my grandfather passed away, we had Thanksgiving at their house every year. I loved that house. When they bought it, Poppie had two requirements – it had to be made out of brick and its street number had to be 212 – the boiling point of water. 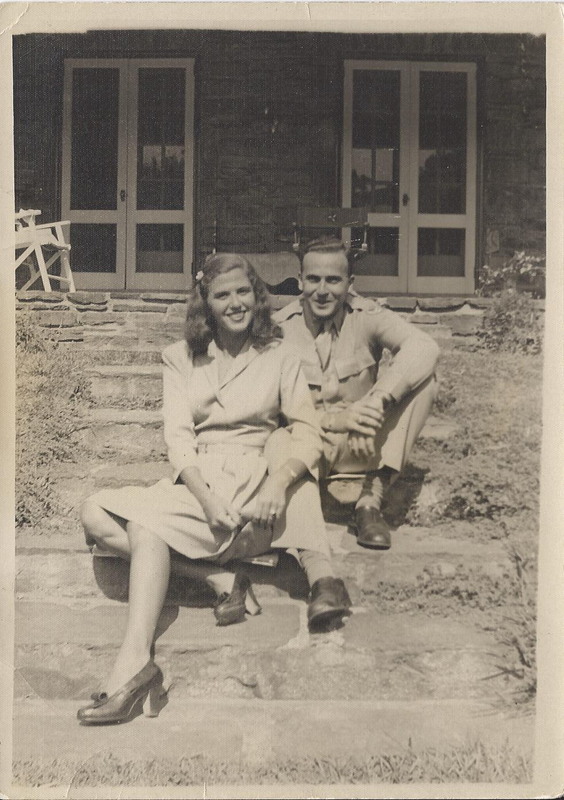 He was an engineer and was in the Army Air Corps (precursor to the US Airforce) when he met Bubbie (before she was a bubbie). Whenever we pulled into their driveway, I would run to the front door. I never had to ring the doorbell or knock because the door was always open behind the screen. I could step right into the living room with its rocking chair, fireplace and potbelly stove. The first floor formed a circle around the stairwell. I used follow that circuit like it was a train track and I was the engine. Through the living room into the den past the bathroom into the pink kitchen around the corner to the dining room and back to the front door. Thanksgiving at Bubbie and Poppie’s was a family affair on par with Pesach. But with bread and no long prelude to dinner. Food and family was the event. And Bubbie reigned over it. You could say she was the train conductor. At least she had the hat for it. Bubbie directed my dad to add the leaf to the dining room table. Then we added another table. Every once in a while we added a third, the table chugging through the doorway into the living room, past the front door towards that potbelly stove. She directed me to set each place with a dinner and salad plate, two forks, two spoons, one knife, two glasses, and a napkin in a napkin ring. There were always napkin rings. Bubbie had to remind me to put the napkins on the left next to the forks. Because I always forgot and put them on the right. Sometimes I still do. Bubbie directed my mother to add fresh dill to the chicken soup. My uncle Michael to stud the sweet potatoes with marshmallows. My aunt Leslie, whom I call Sessie, to cut the vegetables. My aunt Linda to entertain me with stories of when I was younger, like the time when I woke up her and Michael in the den on the sofabed, holding a diaper and asking to be changed. Bubbie removed from the fridge the applesauce she had made from scratch. It’s my dad’s favorite. The first to arrive was always Bubbie’s “kid” brother Sidney who walked in with the tell-tale click-clicking of a box of tictacs in his shirt pocket and a still-dripping bucket of pickles and olives plucked from the barrel at his favorite pickler. He always had always a fresh twenty for each of the kids. And then everyone else arrived with those kids. Everyone seems to remember my chasing my cousin Gary around the meandering table, shouting, “Gawee…Gawee…” I will deny it if you ask me. Around this time of the evening, Uncle Sidney would just turn the volume down on his hearing aid. Before the parade of dishes, we would pour the wine, Poppie would make a toast, and Bubbie would say shehecheyanu – a prayer of thanks for bringing the whole family together to her table. Dinner started with soup. And then turkey filled with stuffing. Cranberry sauce from a can with mandarin oranges. Salad. Green beans. Roasted potatoes. And those sweet sweet potatoes. We’d clear the table and then the adults would retire to the sofa in the living room for a few minutes and the kids would gather on the floor in front of the TV to watch The Wizard of Oz. It was only recently that I ever saw the end of the movie, because once dessert was on the table, no one cared about those red ruby slippers anymore. Dessert started with a fruit-filled jello mold. Really, every year, a jello mold. 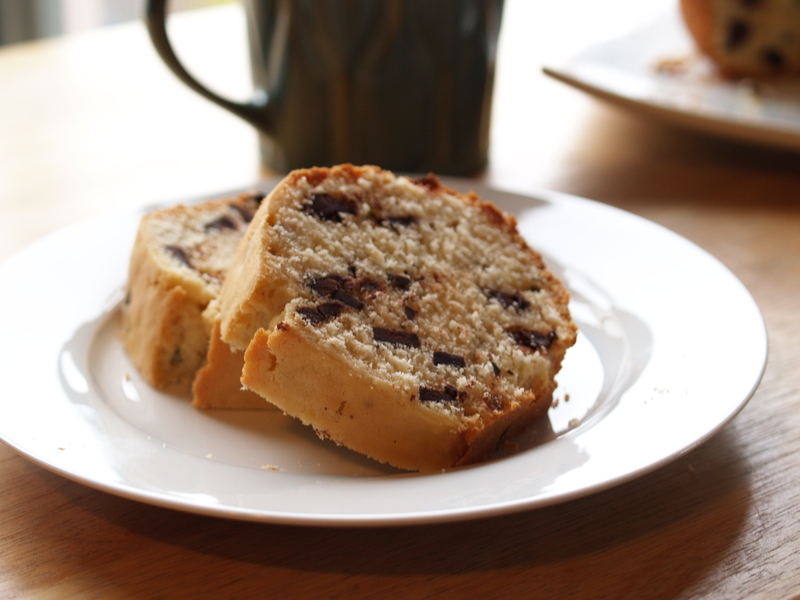 And then pumpkin pie, and my favorite – my mother’s chocolate chip pound cake. When Bubbie passed away, we transferred her china and silver to Sessie’s nearby house. Sessie hosted most holiday meals after that, carrying on the tradition of keeping the family together. Sometimes we fit at the dining room table. Sometimes we need three tables lined up in the living room. Sometimes we set out the good china and silver. Sometimes we set out the everyday dishes. So far, our count is at 9. I think we’ll still fit around Sessie’s dining room table to say shehecheyanu. This is the cake my mom made most often when I was a kid. She got the recipe from her good friend Helen. 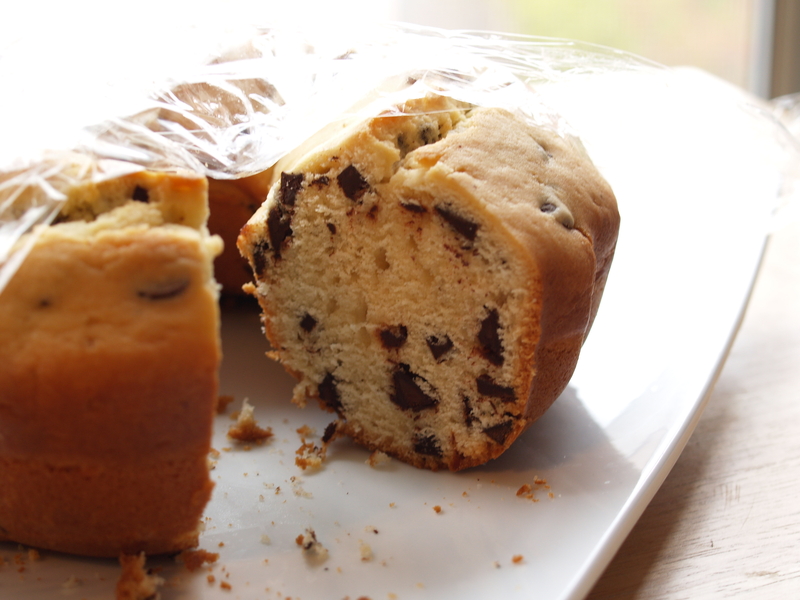 It’s a dense cake studded with chocolate chips that I think is best eaten with a cup of tea or coffee. It’s not a moist, fluffy cake, but it’s what I grew up with and I like it this way. Also, we always coat the chocolate chips with some flour before adding them to the cake so that they don’t all sink to the bottom. I’m not sure it makes a difference, but, well, that’s what we do. 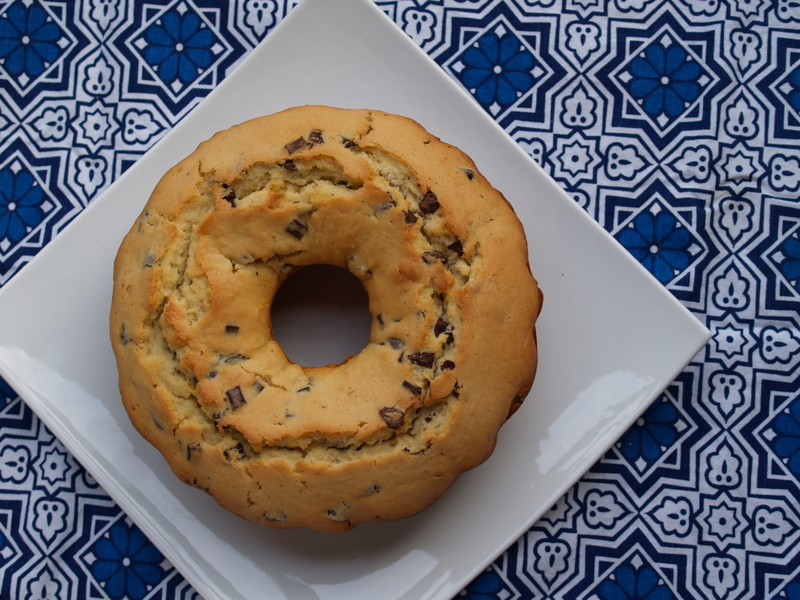 This recipe makes a huge cake and I often end up freezing half. Actually, I might like the frozen cake even better, snuck out of the freezer in the middle of the night, unwrapped from its plastic, and cut into a sliver or two with the false hope that no one would notice. Luckily, growing up with a chocoholic dad meant that generally any sweets theft was assumed to be his. Sorry dad! Prep. Preheat oven to 350º F. Grease a bundt (or whatever) pan – this is not necessary if you’re using non-stick…which I highly recommend. Put chocolate chips and a few pinches of flour in a ziplock bag and shake to coat the chips. Mix. Cream margarine/butter and sugar until light yellow. Add eggs one at a time, mixing in between. Add vanilla. Add a little almond milk, then a little sifted flour and baking powder. Keep alternating liquid and flour mixture until they are both added. I usually do this in about 3 rounds. Add the flour-coated chocolate chips and mix by hand. Bake. Pour batter into a bundt pan (or whatever you have). Bake 55-60 minutes until golden brown on top and a toothpick comes out clean. If you’re dividing the cake between two loaf pans, which my mom often does, bake for 30-40 minutes. Note, if you freeze the entire second loaf, no one can really get away with sneaking slivers undetected. Welcome to week 3 of my cooking techniques course. We’ve already covered knife skills and eggs— now it’s time for stocks and soups. I like soups so much that my friends and I are thinking about having a soupotluck. We made six soups in class on Sunday. Six. Whew. That’s a lot of soup. Luckily, I am now well armed for any soupotluck coming my way. This is a really long post with a lot of information. So for those of you who just glance at the pictures and go straight for the recipe, there are a few main takeaways. And for those of you who want to use my blog instead of dragging yourselves out of bed at 8 am on six Sundays in a row, here’s the summary of what we learned. First we started off with a discussion of stocks. Fond de volaille (chicken stock), fond brun (brown veal or beef stock), fish fumet (fish stock), and vegetable stock. Chef reminded us that stock is a great dumping ground for things you might normally throw out: chicken carcass, limp carrots and celery, dark green leek tops. When you find yourself with some of these extra, less than perfect ingredients, chop them up and throw them in the freezer. And then when you have a few hours when you’re doing other stuff around the house, throw them in a soup pot with water and let them simmer away. Stock adds gelatin and taste to sauces. The gelatin comes from the collagen in bones and joints. Due to the gelatin, when the stock has cooled, it will be a bit jiggly. Vegetable stock has no gelatin and no jiggly. Chef shared with us a whole bunch of tips. First off: defrosting ingredients for your stock. Vegetables – you can just throw them right into the stock. Meats you want to thaw as slowly as possible. The best method is to put the frozen meat in the fridge for about 2 days (especially for a big roast … not that you’d put a roast in a stock, but you get the idea). Next best is “slacking” – run the meat under a steady stream of cold water until the meat thaws. Finally, the quickest way you can safely thaw is to a “warm slacking’ – place the meat in warm water and then replace the water when it becomes cold. Keep doing this until the meat thaws – this can take as little as 20-30 minutes. It’s a no-go on countertop thawing or microwaving. When you add water to bones, make sure the water is cold (helps dissolve albumin protein which keeps the stock clear). The water level should just barely cover the bones (and aromatics) so that the stock is richer (too much water – too dilute). Simmer the bones for about 10 minutes and some scum should rise to the top – skim it off. Don’t stir the stock because this will move the scum around and will be harder to skim. Don’t boil the stock because it’ll also move the scum around. If you don’t get most of the scum, the broth will be cloudy. Got that? Don’t stir and don’t boil. Because, really, who likes scum? After your first scum skimming, add the aromatics vegetables and bouquet garni. Mirepoix is the classic aromatics mix: 50% onion, 25% carrot, 25% celery. But who needs to be classic? You can use leeks. Or zucchini. Or whatever you like. The smaller the bones you’re using, the quicker the stock will finish, and the smaller you’ll have to chop the veggies (more surface area means they cook more quickly). So for fish fumet, you’ll need a small brunoise. Tie together thyme, bay leaves, and parsley stems into a bouquet garni. Want to be fancy? Wrap the boquet in a dark green leek leaf, and then tie it up. You can also use cheesecloth to make the bouquet easier to remove. Don’t add salt when you’re making stock. You’ll be adding it to whatever you make with the stock. You know that the stock is ready the bones start falling apart — it means that all of the collagen has broken down. This takes about 30 minutes for fish. About 3-5 hours for chicken. And a brown stock? A whopping 8 – 24 hours — just let it simmer (not boil!) overnight. Vegetable stock typically takes about an hour to make. When the stock is done, strain it. First strain out the big stuff through a colander. Do a second strain through a fine mesh anything – an expensive chinoise if you have one (please ignore the racist French name) or cheese cloth. Cool the stock down and then skim off the fat. 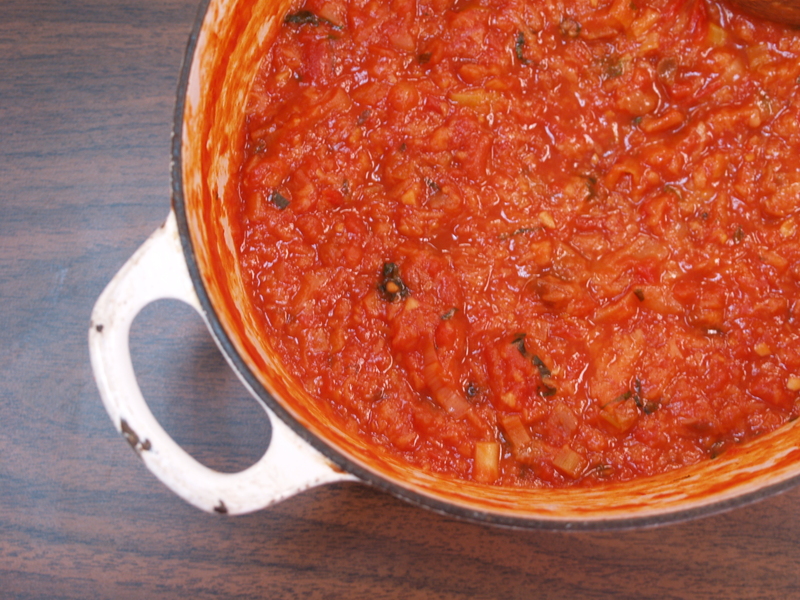 Don’t put a bit pot right into the fridge – it’ll warm up everything else in the fridge. To cool it off, put it covered outside in the snow if it’s winter, or distribute across several smaller containers and bring it down to room temperature before putting it in the fridge. Remember – once it has cooled, a good stock will be gelatinous. 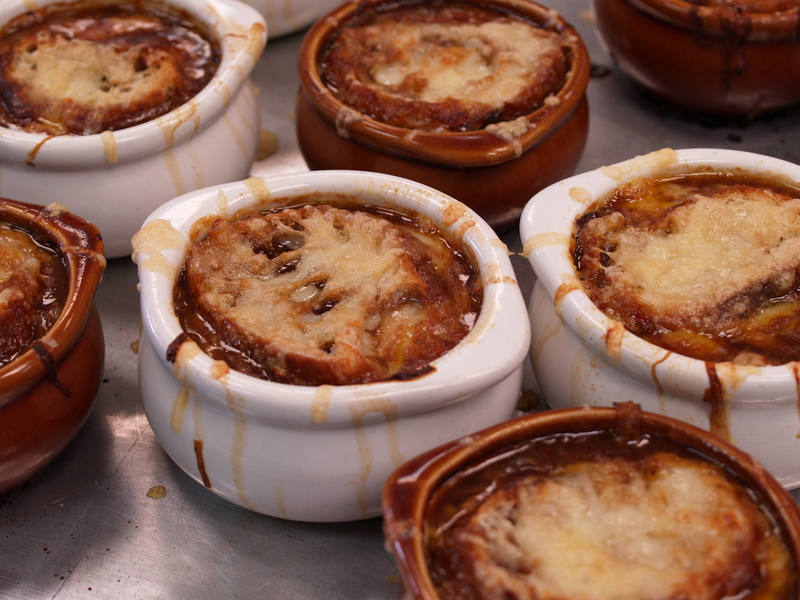 We didn’t make our own stock due to time constraints, but we did use them as a basis for all of our soups. Before we served our soups, we did a seasoning exercise with salt and acid. Except for a few situations, we didn’t add a drop of salt until we finished cooking the soups. We tasted the soups without any seasoning at all and then slowly added salt until the full flavors developed. A good rule of thumb is about 2-3 teaspoons per 2-4 quarts of soup. But the better rule of thumb is add salt until it tastes good. We then added acid – either lemon juice, vinegar, or wine. The acid brings a bit of freshness to whatever you’re making, and also reduced the effects of salt. So, you may need to a bit more salt after the acid. Or, if you have added too much salt, acid can make your dish taste less salty. This is a very rich soup. Very rich. I, who never like cream of anything soup, loved it. Just a little goes a long way. 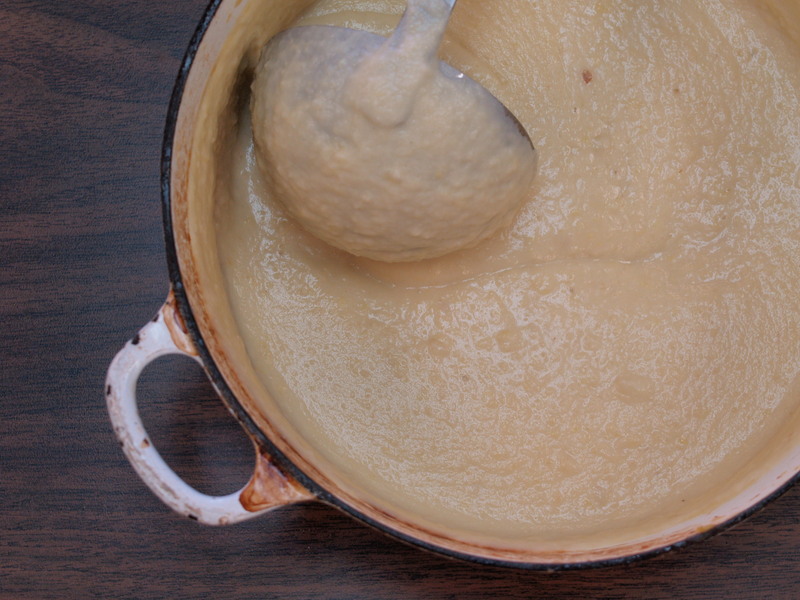 After cooking the potatoes, you’ll drain and puree them – make sure to reserve the liquid or you’ll be left with mashed potatoes – amazing mashed potatoes, but they won’t be soup. That pinch of nutmeg – Chef reminded us last week that nutmeg makes cream creamier and cheese cheesier. We made hazelnut pesto since one of my classmates is allergic to pine nuts – I think this version is even better than the classic. And any leftovers can be thrown on pasta. Prep soup. Finely chop whites and light green leaves of the leeks. Soak them in cold water and agitate a bit — the dirt will fall to the bottom. Peel the potatoes and cut into cubes..
Cook soup. Melt butter in a big saucepot over medium heat. Add leeks and cook until very soft (the light green leaves will turn translucent). Add potatoes and stock and cook covered until the potatoes are very soft (taste them to check texture). Puree soup. Drain the potatoes and leeks but reserve the liquid. Don’t forget – reserve the liquid. Push the potatoes through a sieve, food mill, or potato ricer. (Unfortunately, an immersion blender will just make the potatoes gummy.) This is a little bit of a pain. Mix soup. 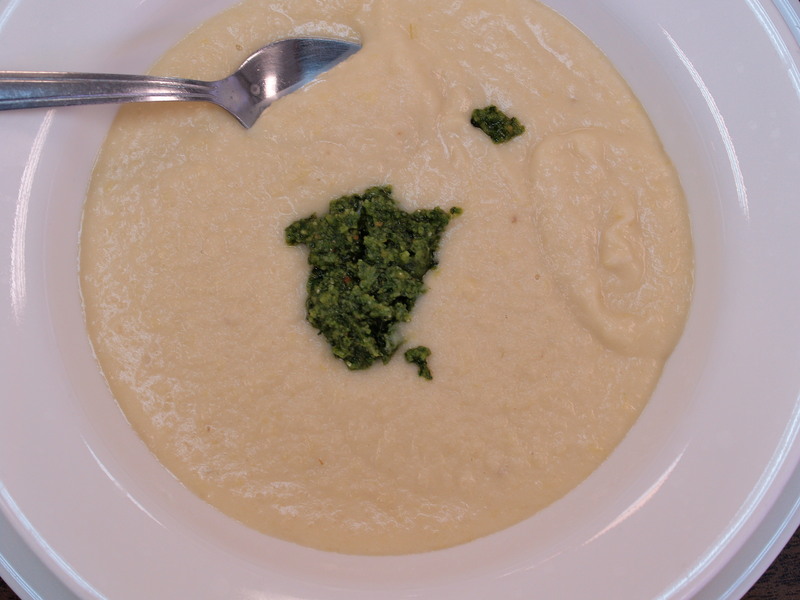 Mix the potatoes with enough cream and reserved liquid to make a creamy soup. Season and taste soup. Add a pinch of nutmeg and pepper (white pepper if you really want the soup to be perfectly white). Add salt about a teaspoon at a time, tasting with each addition. When it tastes good, add some lemon juice, a few drops at a time. Taste again for salt. Prep pesto. While the potatoes are cooking, toast the hazelnuts. Hopefully they’re peeled, but if they’re not, put them in a paper bag when they’re still hot, close the top, and let them steam. A quick rub in a towel should do the trick for removing the skins. 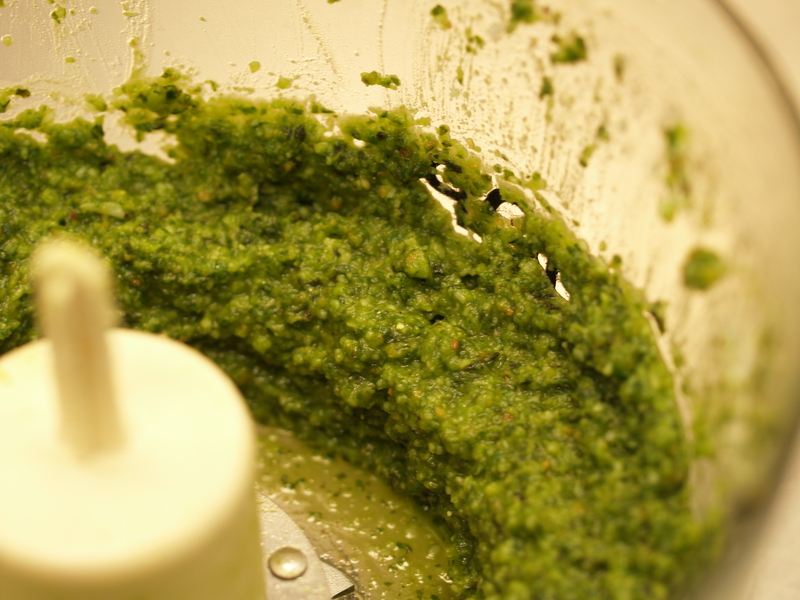 Puree pesto. 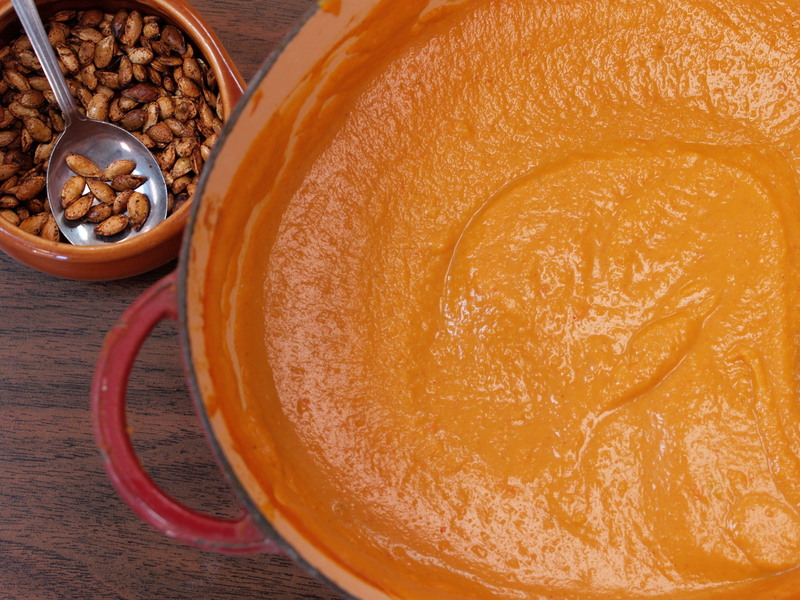 In a food processor, puree the hazelnut with 2 T olive oil until you get a smooth paste. Add the garlic and process again until smooth. Add basil and salt and keep processing. Then, very slowly alternate cheeses and olive oil a little at a time until you get a very smooth puree. Add salt to taste. Eat. 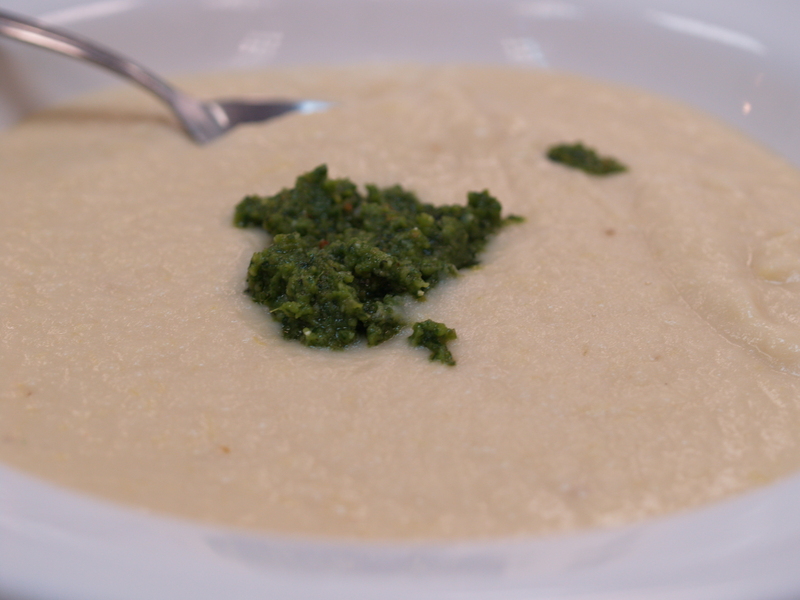 Top soup with a nice spoonful of pesto. Today was stocks and soups day in my cooking class. There will be much more on that later, but first, a quick post and recipe. Last night was closet cleaning out time. Actually, it’s always closet cleaning out time at my place. This time, the cleaning extended to the fridge and pantry. I used up four cans of black beans, a can of crushed tomatoes, a bunch of onions and garlic, and some labne from the fridge. 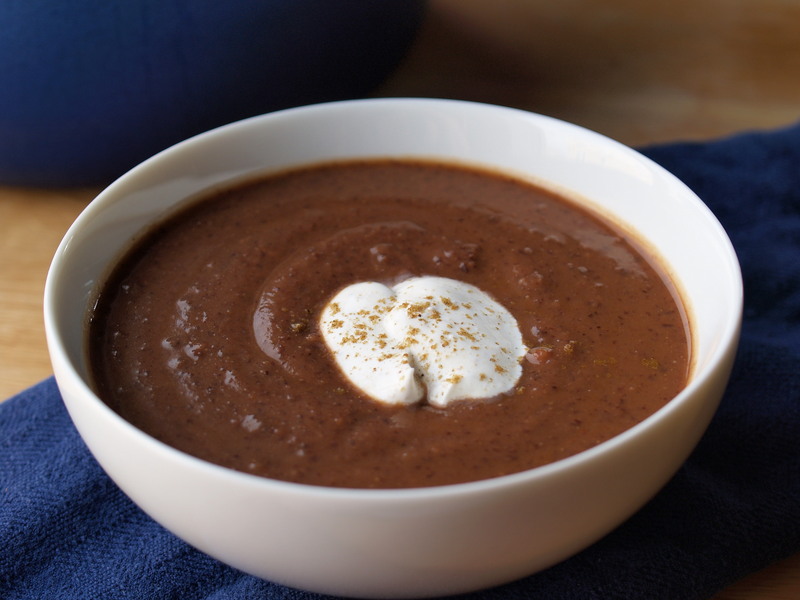 The inspiration for this soup came from Smitten Kitchen’s own black bean soup with toasted cumin crema. I ditched the peppers, used canned beans instead of dried, added tomatoes, and substituted labne for the crème fraîche. My soup is thinner and more brown in color (due to the tomatoes). Prep. Chop onions and garlic. Finely chop chipotle. Drain beans and sprinkle with some baking soda (helps make them more digestible). Cook. Saute onion in oil until brown, about 8-10 mins. Add garlic, chipotle (and all that adobo sauce), and spices. Cook over low-medium heat for another 5 minutes. Add tomatoes and water. Simmer about 15 minutes. Rinse the baking soda off the black beans, and dump them into the soup. After another 10 minutes, whizz with an immersion blender and add salt and lime juice to taste. Top. Thin labne with some warm water and mix with cumin. Add a dollop of labne to the soup and sprinkle a little cumin on top. You know how I like my kitchen appliances? How sad and lost I am when they break? Unfortunately I have another one to add to the graveyard collection. And this one will require a bit more research to replace and upgrade. Luckily I have my culinary school instructors to offer advice (and maybe a discount!). As you may have noticed, I’ve moved past the bread machine for my challah and onto the KitchenAid mixer. Just one attempt at the really old-fashioned way was enough (un œuf!) to remind me how much I rely on my tools. My fourth challah recipe, this time an Israeli one from Janna Gur, pushed my mixer over the edge. Literally. The sweet egg-y dough had been kneading in my mixer for about 7 minutes continuously when I heard a strange clunking. A loud whir. A grumble. I jumped from my perch on the couch to investigate the commotion. I made it to the kitchen in time to see the arm of the mixer flapping over the bowl as the kneading hook turned. And then the mixer – bowl, dough, flapping arm and turning hook – took a few hops on the counter before diving to the floor. The bowl stayed miraculously locked to the base. The dough securely cradled inside. The arm was nice and warm. Really warm. Too warm. I kneaded the rest by hand. I am not quite ready to share the challah recipe that led to my mixer’s demise because I haven’t worked out all the kinks. However, I did want to pass along a “braiding” technique that makes really unique challot. I discovered this braiding technique from Anne Sfez, who writes the bilingual French-English blog a foodie froggy in Paris. 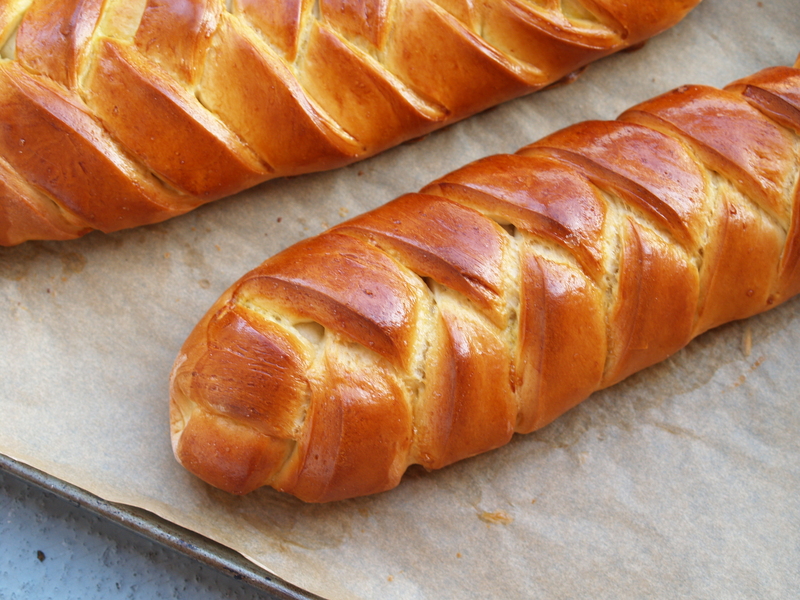 Rather than braiding the loaves like you might braid your hair, she shapes challah like a danish. Anne has a great pictorial that is very easy to follow – you should check it out. But if you like unnecessarily wordy, here are my directions. Roll. After it has risen, roll the dough into a rectangle. The size of the rectangle is up to you, but I usually make one dimension twice the length of the other. Cut. You’re going to make evenly spaced diagonal cuts on both sides of the dough – the dough will then look like a feather. The trick to this is getting all of your cuts at the same angle and symmetrical. Mentally divide the rectangle lengthwise into thirds. Place a ruler one-third of the way from the right side (or the left side if you cut left-handed). Make a series of parallel diagonal cuts down the right side, using the ruler as a guide, and cutting towards you. I use a big chefs knife or dough scraper so I can make each cut in a single swipe and keep my wrist at the same angle. I usually leave 1-inch or so between cuts. Flip.When you’re done with the first side, flip the dough over so the cuts are now on the left and facing you. Use a little extra flour if you need to. This is a full flip, not a 180-degree turn (which would leave the cuts also on the left, but facing away from you). Cut again. Line up your ruler again, one-third from the right side of the dough. Using the ruler as a guide, make diagonal cuts with your right hand. Make sure that each cut starts directly across from its pair. When you finish, you should have a symmetrical feather. Fold. Starting at the top (the point of the arrow), fold the first flap towards the center, then fold the opposite flap towards the center and over the first. Repeat this right-left-right-left (or left-right-left-right) until you reach the bottom of the feather. You’ll be left with a little trapezoid/triangle. 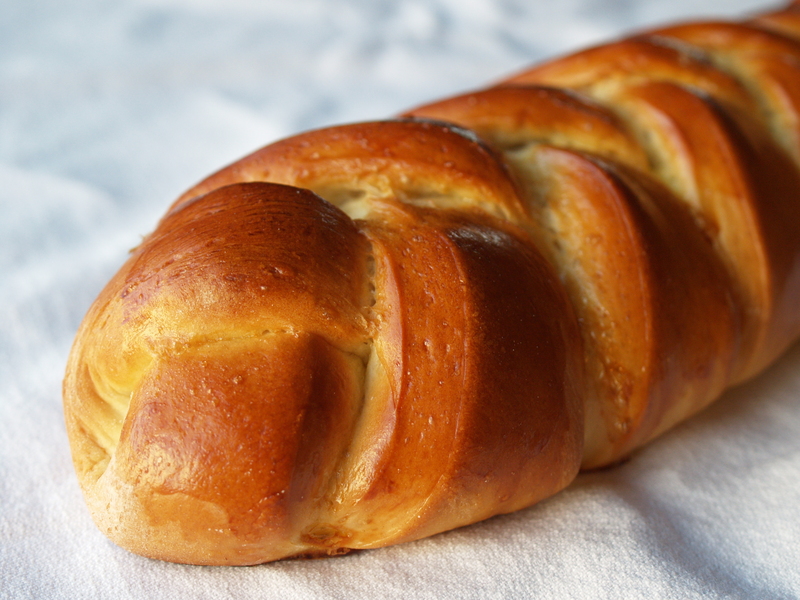 Pull it off and make a challah roll with it. This makes it easier to tuck the last few edges underneath the end of the loaf. Welcome to week 2 of my cooking techniques course. Last week was knife skills. This week, eggs. Of course, I walked into class this morning with all of my very very very dull knives to sharpen. Brian, one of the school’s purchasing managers and my new best friend, sharpened all my knives for me. But more on that later. First, let’s get to the food. A few tidbits about eggs. The fresher the egg, the thicker and more dense the white (“albumen”) and the more prominent the little umbilical cord (“chalazae”). To check for freshness before cracking, place in a glass of water – if it sinks it’s fresh; if it floats, that means that the air cell (that little bubble you sometimes see in hard-cooked eggs) is big and the egg is less fresh. Since eggs shells are gas permeable, the older the egg, the more air enters, creating a big air cell. Always crack an egg on a flat surface (a countertop is great) to avoid getting shells in the eggs. Separate yolks from whites using your hand rather than passing from jagged egg shell to jagged egg shell. Eggs boil at 180ºF, water at 212ºF. So be careful when adding eggs to hot water and other liquids if you don’t want them to scramble. Always beat egg whites at room temperature. Copper bowls are best, but if you don’t have one, add a pinch of cream of tartar or sugar to help stabilize the whites. We cracked and cooked no less than sixty eggs, folks. That’s more than five dozen. And we definitely cracked five baker’s dozen because some of them inevitably made it into the garbage. Between the twelve of us, we pretty much ate them all. If you’re counting, that’s about 5 eggs per person. When I was first learning to speak French, my teacher used English-French puns to help us learn pronunciation. In french, un œuf is an egg. The pronunciation is not entirely obvious, especially when you’ve only barely mastered the alphabet. So she told us, “one egg is enough.” One egg, un œuf is pronounced like “enough.” Sort of. If you don’t think about it too hard. Puns are never funny by the time you explain them. 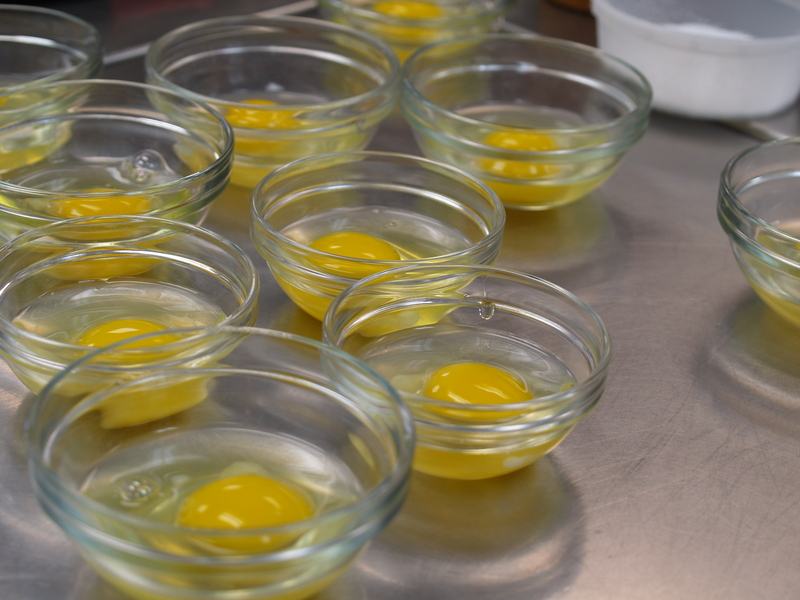 Moving on and back to cooking, we started class this morning with a few egg basics. Note, I did not say hard-boiled eggs. Because hard-cooked eggs are not boiled. Instead, you put the eggs in a single layer, add water to cover eggs by at least 1 inch, cover and bring water to a boil and then remove the pan from the heat. Let eggs stand in hot water for 10 minutes. That’s it. Run under cold water or put in an ice bath until completely cooled. A little trick – the air cell usually forms at the bottom (the fat end), and if you crack it there, it’s easier to peel because you more easily get under the shell membrane (that thin, translucent film under the shell). Same as hard-cooked, but you let the eggs stand in the water off the heat for only 4-6 minutes. This is the basis of the eggs Benedict (no bacon for me) that my team made. 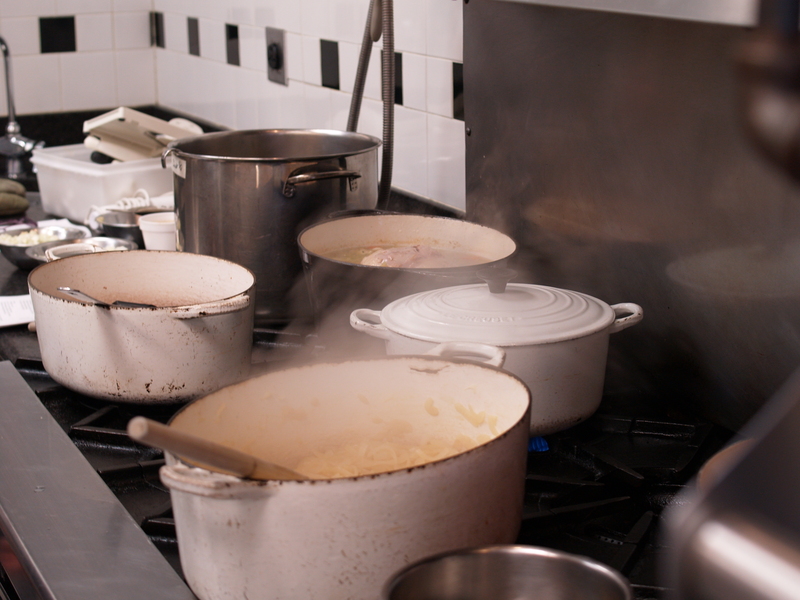 In a saucepan, bring 2-3 inches of water to a boil. Here’s a trick so you don’t have to pull out your ruler: unless you have abnormally long or short fingers, your index finger is about 3 inches from tip to palm. From finger tip to second joint is about 1.5 inches. So, just stick your finger into the (not yet boiling) water to make sure you have enough (un œuf!). Prepare a bowl of ice water next to your stove. Boil the water and then lower the heat to a simmer. Break a cold egg into a small bowl. Hold the bowl very close to the water (I actually put the bottom of the bowl into the water) and quickly tip the egg into the simmering water. Cook until the white is set and yolk begins to thicken but is not hard. This takes about 3-4 minutes. To test the egg, gently lift it out with a slotted spoon and gingerly touch the white. It should feel firm. If it’s not yet done, slip it back in to the simmering water for another 15-30 seconds. When the egg is ready, take it out of the simmering water and slide it into the ice water for about half a minute to stop the cooking. Then drain on a paper towel. 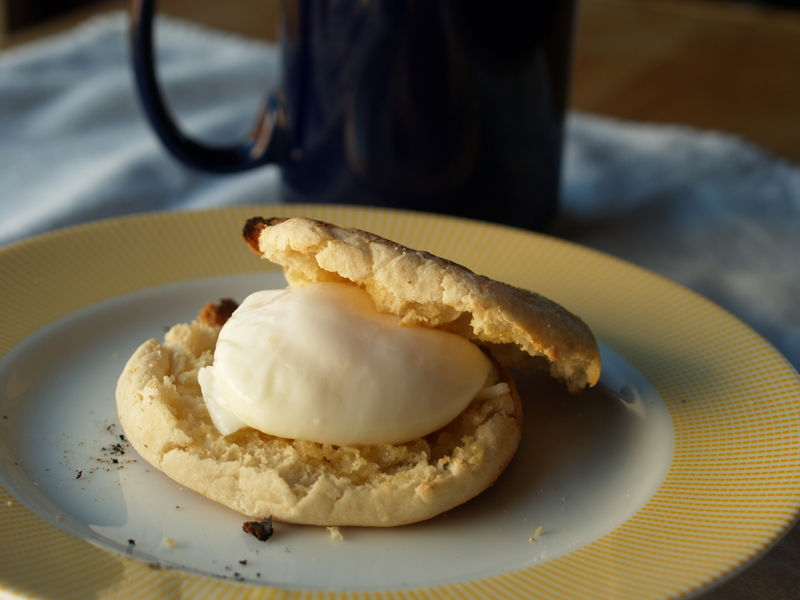 To make the eggs benedict, toast an English muffin brushed with butter, top with poached egg and then hollandaise (see below). If you’re eating bacon/ham, put it between the muffin and egg. Next, we moved on to egg-based “mother sauces.” The main components of hollandaise and mayonnaise are egg yolk, fat, acid, and an emulsifying aid. Hollandaise is a cooked sauce, mayonnaise is uncooked. Hollandaise uses butter, lemon juice, and cayenne. Mayonnaise uses oil, lemon juice or vinegar, and mustard (dry or prepared). After mixing the yolks with the acid and emulsifier, add the fat very slowly. Really slowly. Teaspoon by teaspoon, and whisk to incorporate in between additions. You can increase the amount of fat towards the end, adding a tablespoon at a time. Season with salt and pepper and other flavorings at the end. Melt 8 ounces butter. In a saucepan, mix together 1/4 C water, 2 T lemon juice and a pinch of cayenne pepper and reduce over medium heat down to 2 T. Why take 2 T lemon juice, dilute it, and then reduce it back to 2 T? Here’s the deal: heating an acid activates it, so you need to dilute it with water so it’s not too strong, but you only want about 2 T of acid for the sauce. Cool slightly, and whisk in 3 egg yolks over very low heat until the mix is thick and creamy. Remove from heat and pour warm melted butter in teaspoon by teaspoon, whisking constantly. If the sauce thickens too much, add a little warm water to thin it out; if you need to reheat the sauce, add some extra water and warm over low heat, whisking periodically. Whisk together 2 egg yolks, 1/4 t dry mustard (or 1 t regular mustard), 1 t lemon juice or wine vinegar. Slowly whisk in 1 C vegetable oil teaspoon by teaspoon as with the hollandaise. If the mix gets too thick, add a little water or lemon juice to dilute. Add salt to taste. A few mayo notes. 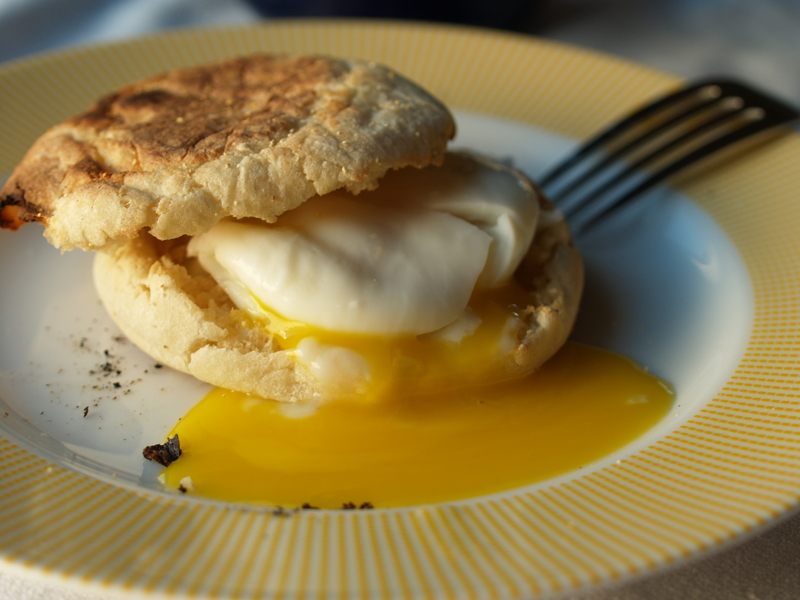 The ratio of yolk:oil ranges from 1:1/2 C to 1:1 C. Commercial mayo tends to go to heavy on the oil — that’s why it’s lighter colored than ones you make at home. If you “break” your mayonnaise, i.e., added your fat too quickly without incorporating, you can add another egg yolk and then slowly slowly whisk in more oil. 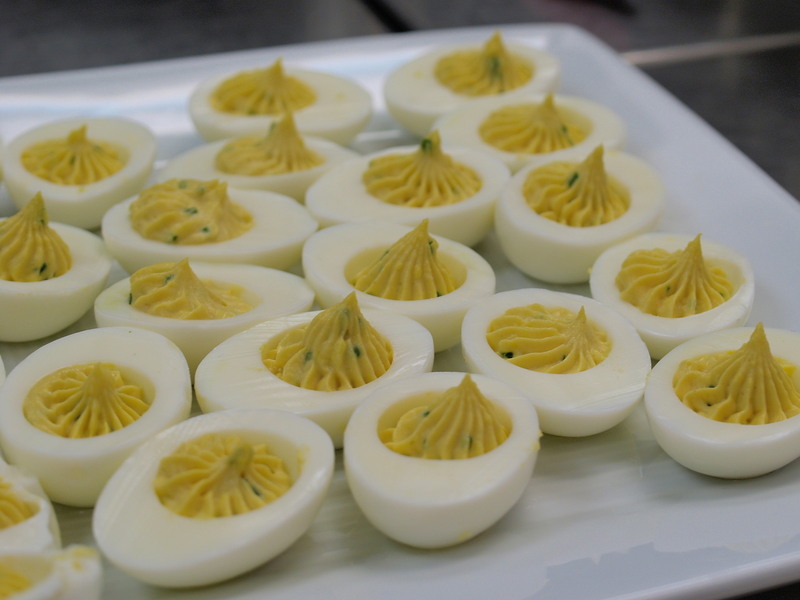 Mix cooked egg yolks with mayonnaise, mustard, and finely chopped chives and fill hard-cooked egg whites for deviled eggs. Cheese soufflé was a masterpiece. While I wasn’t able to make this myself, I was an interloper, trying to pick up as many tips as I could. For a soufflé, it’s important to have your “mise en place” all prepared. Greasing a soufflé dish and sprinkle with cheese. Make a collar out of aluminum foil to help the soufflé rise: rip a piece of foil long enough to wrap around the dish, and then grease top half of the foil, followed by a sprinkle of cheese. Cut a piece of string long enough to tie around the dish. To the béchamel, add 3 egg yolks one at a time, mixing well after each addition. Stir in 1/2 C grated cheese (we used Gruyère). Clean a copper bowl really well – wipe down with a vinegar-salt solution, rinse with water, and wipe completely dry. Beat 4 cold egg whites until stiff and glossy. (Let’s be honest…at home, I will probably just use my mixer with a pinch of cream of tartar.) Stir 1/4 of the egg whites into the cheese mixture. Then pour the cheese mixture into the egg whites. Use a spatula to fold the remaining egg whites into the cheese. 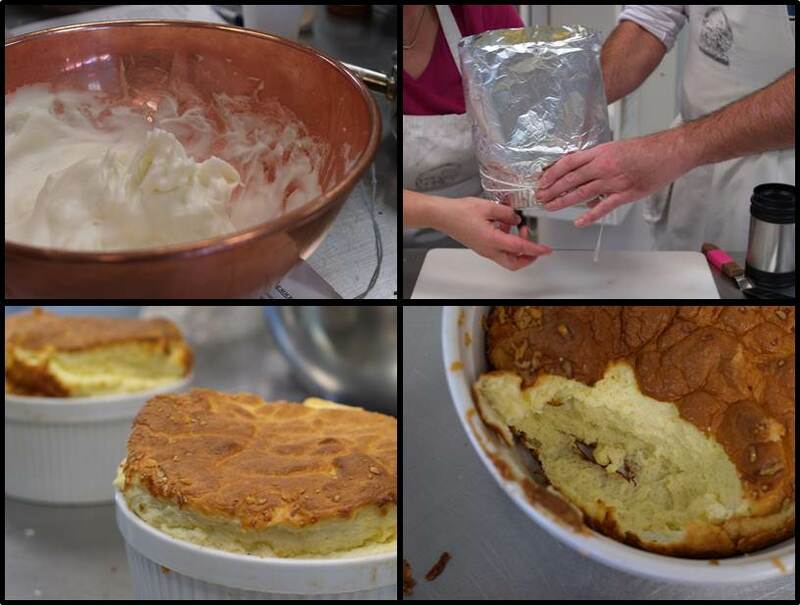 Immediately and gently, spoon the soufflé mixture into the prepared dish – fill about 1/2 inch from top. Tie the aluminum collar around the dish (cheese obviously facing in). Bake on the bottom rack until a skewer comes out clean, about 30 minutes. 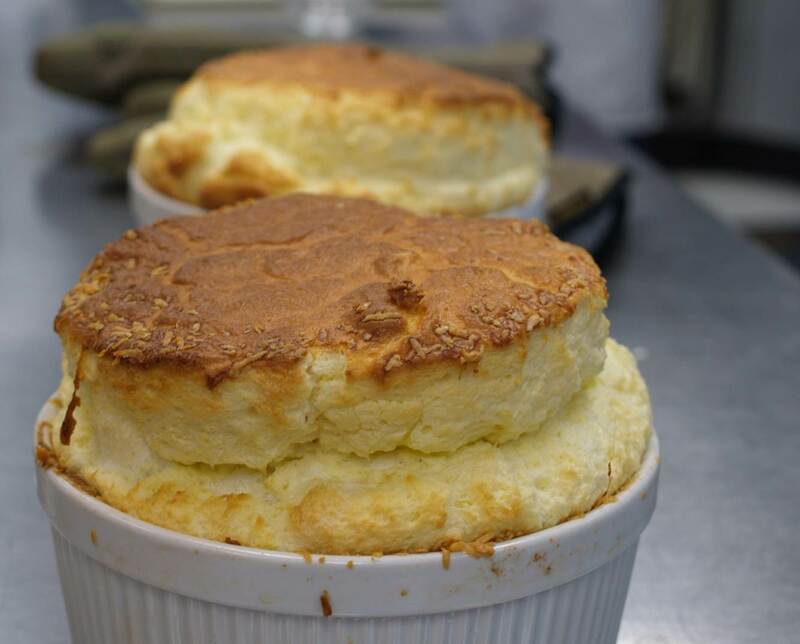 Once the soufflé goes in the oven, don’t open the door for at least 20 minutes. Don’t even touch the door. While the soufflés were baking, I brought my knives downstairs for a little sharpening. Actually I brought two blocks full of knives (one dairy, one meat) to sharpen. Actually, I brought two blocks full of knives for Brian to sharpen. After a quick inspection, he identified the five that were worth saving. He also scolded me for throwing my knives in the dishwasher. 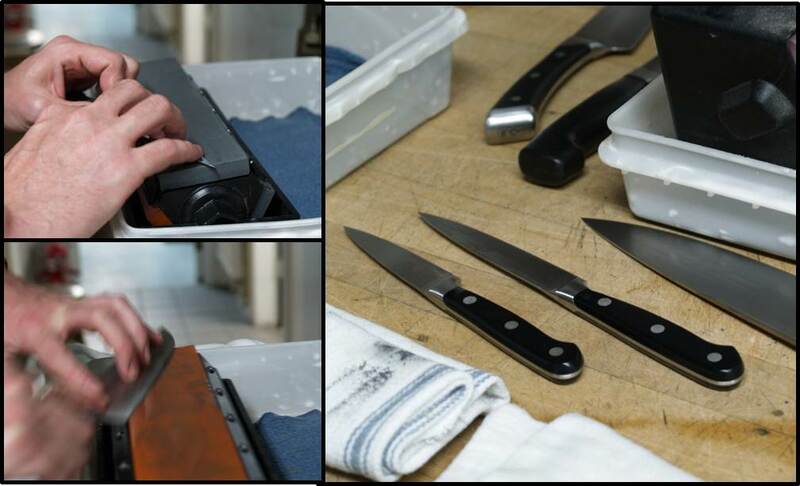 Brian sharpened each knife on three or four surfaces and then a final honing on a steel. I watched. Well, until I heard that the soufflés were coming out of the oven and I rushed upstairs to snap a few photos. We also made a few quiches, a frittata di cipolle (onion omelette), and pipérade and scrambled egg (a dish from the Basque region of the Pyrenees). 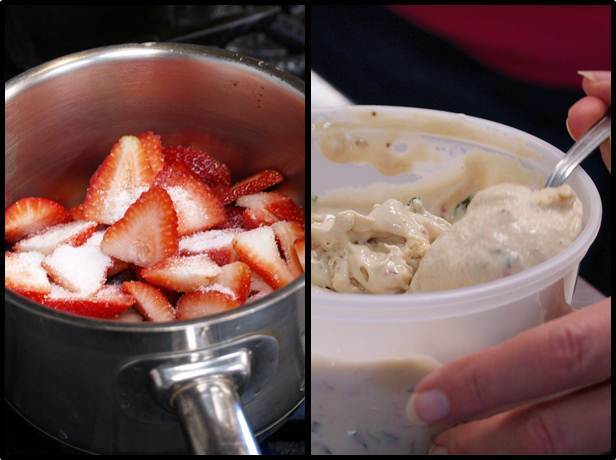 To seal the deal, we made strawberry basil black pepper ice cream. 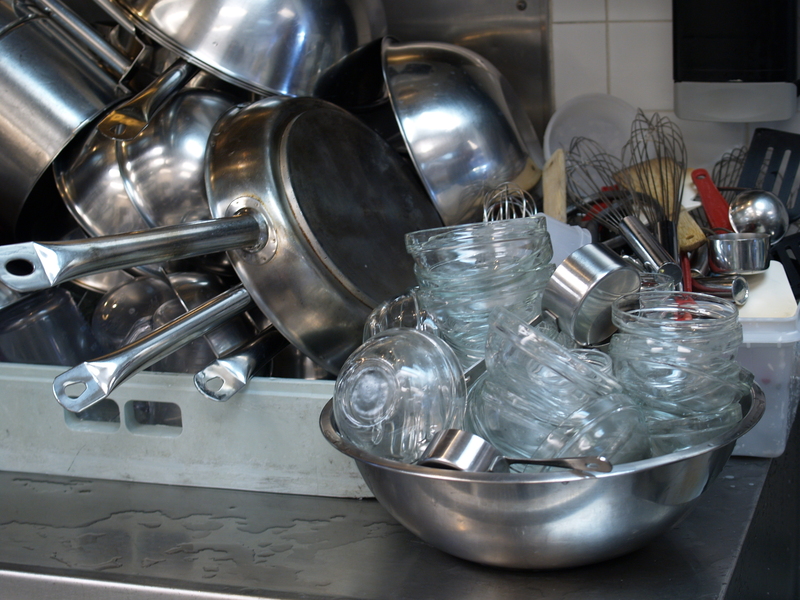 Luckily, we don’t have to clean all of our own dishes. Because you know how I hate to wash dishes. Are you ready for another FrEnglish pun? What happened when three cats fell in the lake? Get it? You probably know that un, deux, trois, quatre, cinq is counting from one to five in French. But in FrEnglish, you can read the first three words in French as un de trois, meaning one of three and the last two words transliterated into English as cats sank. So, what happened when the three cats fell in the lake? One of the three cats sank. Am I the only one giggling?